This information is solely about his work in periodicals, provided here as a way to share information with anyone who might be able to help me pinpoint publication information and possibly locate copies of these works. Most of the work listed appears to be for pulp romances, possibly Munsey's All-Story Love Stories (I have pinpointed one in Street & Smith's Love Story), but I have really only been able to locate the work in the more upscale magazines -- the "slicks" -- so far. Please contact me at margo@ogram.org if you can help me locate any of these in print. Thank you! 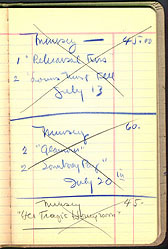 To the right is the image of one of the pages from 1933 in the first account book. Keyes Article 6/29/1933 Good Housekeeping $200 NOTE: This is likely Francis Parkinson Keyes (1885-1970) American author of historical fiction. Allan LeMay Story 7/10/1933 United Rule $10 NOTE: Alan LeMay (1899-1964) was primarily a Western story writer, and fairly prominent. He made a transition from the pulps to the slicks about this time. He went on to become a Hollywood screenwriter, and is best known for his novel The Searchers. Man from the Bush 4/1934 Tate $250 NOTE: This may have been for a version of the play "The Man from the Bush" by Australian playwright Henrietta Drake-Brockman (1901-1968), first produced in 1932 and published in 1934. Runaway Linda (serial) 3/1/1939 Church School 5 $125 NOTE: This appears to be a serialization of "Runaway Linda" by 1932 Newbery Honor Book author Marjorie Hill Allee (1890-1945). The book version of "Runaway Linda"was published in 1939 by Houghton Mifflin, with illustrations by David Hendrickson. Return to the Armstrong Sperry Home Page.